We stopped tailored clothing buyer, Marlene, around the office water cooler and asked her what’s new for fall. She was happy to give us the scoop. PF: Let’s talk tailored clothing. First off, what’s new in suits? M: We’ve got our Donegal suit, which at $499.50, is one of our higher price points, but it’s still a steal. There’s a certain breed of style pundit who’s big on rules. Some pertain to style, others to appropriateness, and still other to your hair, skin tone and body type. Some of these rules have logic to them — a short, rail-thin guy might look a bit odd in a big-patterned sport jacket as only half the pattern fits on his small build — while others are just arbitrary nonsense. Menswear author G. Bruce Boyer has an anecdote he likes to share about how so many body-type rules are hogwash. 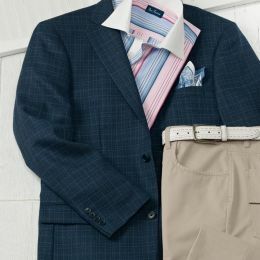 When it comes to talk of tailored clothing, suits seem to get all the attention. 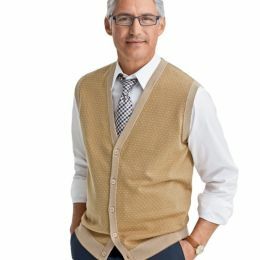 Yet legendary dressers like Fred Astaire and Luciano Barbera— not to mention your humble author here, who has the same preference though is slightly less legendary — have often preferred sport coats.